Toronto-based Leisure Design has become a big player in the casual furniture industry as consumers continue to seek out stylish designs that will transform their backyards into outdoor sanctuaries. Today’s shoppers are also concerned about durability and prefer products that will hold up for many years. Leisure Design meets these demands by developing furniture from the finest materials. All of its frames are fully welded and are made of heavy-gauge aluminum. A two-step powder coated finishing process provides extra protection. Genuine Sunbrella® cushions and patented all-weather wicker weave are other important features. Leisure Design also utilizes the talents of award-winning furniture designer, Robert Mainville (Long Beach, California) to create eye-catching pieces that focus on comfort. Here are two popular collections that your customers will love. The Mission woven collection becomes the focal point of any outdoor landscape. These oversized, modular pieces can accommodate large groups with ease. All pieces are sold individually, so customers can mix and match them to meet their space and functional needs. The Charleston woven collection conjures up the romance of Southern living and of enjoying a sultry summer day on a porch or patio. Featuring a full selection of dining and deep seating, the collection includes single and double chaises. 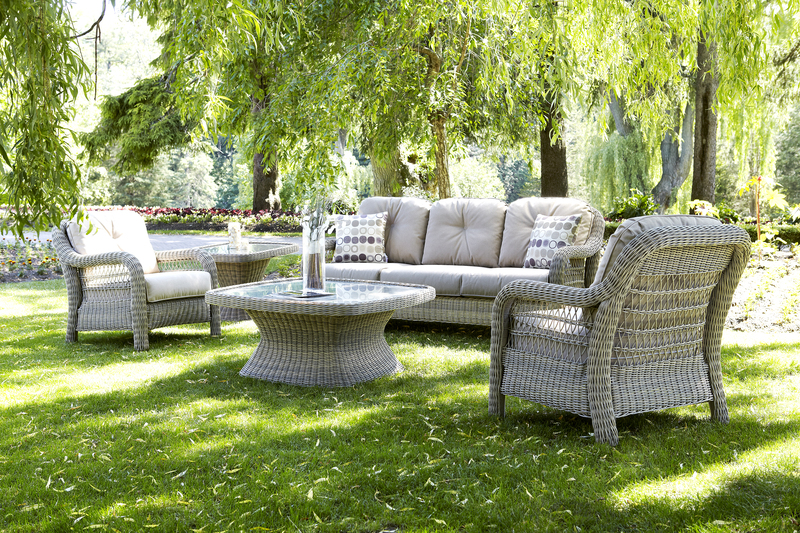 The Charleston collection creates the perfect ambience for life outdoors.